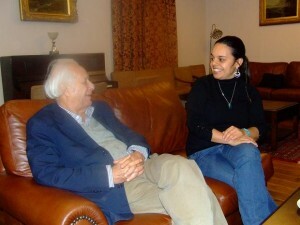 This week, Professor Samir Amin was in Nottingham, UK for a series of lectures and seminars organised by the Centre for the Study of Social and Global Justice (CSSGJ) University of Nottingham. Having delivered an initial talk at Nottingham Occupy about the Arab Spring we at Ceasefire were privileged to have the opportunity to carry out an in-depth interview with professor Amin. The interview covered topics as diverse as world systems theory, the Arab spring, political Islam, the contemporary crisis of capitalism and the nature of 21st century socialism. Samir Amin is a Franco-Egyptian political economist, one of the leading world systems theorists, author of over 30 books, member of the International Council of the World Social Forum and Chairperson of the World Forum for Alternatives. For nearly six decades Samir Amin has demonstrated tireless commitment to combining theory with practice by making it relevant and meaningful for developing political strategy and analysis. Entering his ninth decade he continues to be prolific in his analysis of contemporary political events and to be at the heart of anti-imperialist and anti-capitalist struggles. The breadth and depth of knowledge and political experience that he demonstrated throughout the interview was striking. Particularly important was his analysis of the ‘autumn of capitalism’ (its decline and crisis) and his discussion of the conditions that will enable the development and consolidation of multiple springs of revolutionary renovation across the globe. His spoke of his theoretical journey as one that begins from Marx but moves beyond the Eurocentrism of much classical Marxism by developing a voice from the South. This voice from the South places the inequalities between the core and periphery as the axis around which the most explosive contradictions of the capitalist system arise. Those on the periphery of the Global South, including the informal poor and the peasantry are placed therefore at the centre of the practice and theory of revolutionary struggles, not on the margins. Their political experiences can offer lessons for those of us in the global north struggling against capitalism’s destructive tendencies. Another striking aspect of our discussion was his focus on the logics of de-monopolisation at the heart of the Egyptian struggle. He talked of the lessons he continues to receive from new forces of revolutionary politics. He found it striking how, instead of a depoliticized youth as presented in the mainstream media, the Egyptian youth he has worked with are clear in their rejection of the logics of competition and instead embrace logics of solidarity in their political organising. He also explained how experiences such as these have led him to argue for the need for the left to be reflexive about its historic practices and to leave behind those that are no longer relevant for contemporary struggle and embrace questions of gender, ecology and participatory democracy. Samir Amin brings to our contemporary struggles a wealth of experience, understanding and wisdom. Yet he also acknowledges that there can be no models professed by great thinkers which “we must follow”. Rather the struggle for emancipation and democracy is one of invention and creativity, of learning from the past and combining this with the realities and needs of present. Historical patience is part of this, he argued, a historical patience that recognises that these will be long struggles which will have both victories and defeats. Yet, he believes these are struggles through which we may be able to transform the autumn of capitalism into the spring of 21st century socialism. Andrew Robinson’s two-part introduction to the work of Samir Amin can be read here and here.